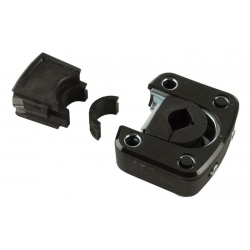 If you wish to use your front mounted Bobike child seat on more than one bike or you have lost the mounting kit which came with your seat, this replacement mount is the part you need to allow use of any Bobike Mini+ or Mini City child seat to be used on your bike. Comes with mounting parts for standard 1 inch (25.4 mm) stems and also a set of parts of 1 1/8 inch (28.6 mm) stems. See Additional Images for a photo of the parts provided.